How To Get A Treadmill for CHEAP! As you know, I’ve been running with Zombies, Run! I’ve talked A LOT about it, so if you have no idea what I’m talking about here are some refreshers. Starling Fitness – Camilla Luddington Loves Zombies, Run! 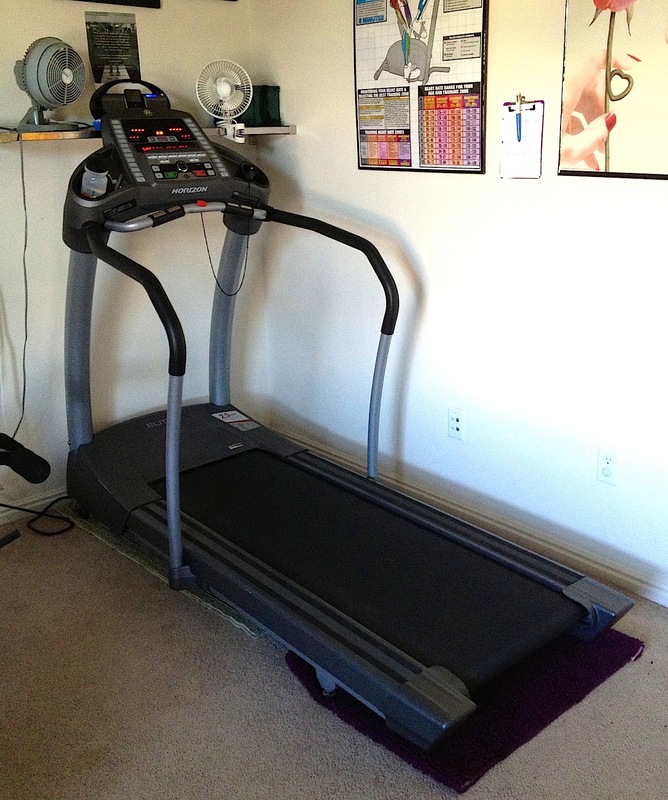 Right now, I’m trying to get faster, so I’m going through the workouts on Zombies, Run! 5K. They are set between episodes 1 and 2 of the original app. Right after the death of the previous Runner Five. Just a warning, Sam (the radio operator) is a little distraught over her death. I love this animated GIF I found over on Love Green Tea. You’d think that this image would make me want to buy the shoes, but it doesn’t. Just seeing those beautiful running shoes being laced up makes me want to go on a run, not buy the shoes. Someday, I even hope to have legs that are thin and strong like those ones. I found this image and it really helped me. 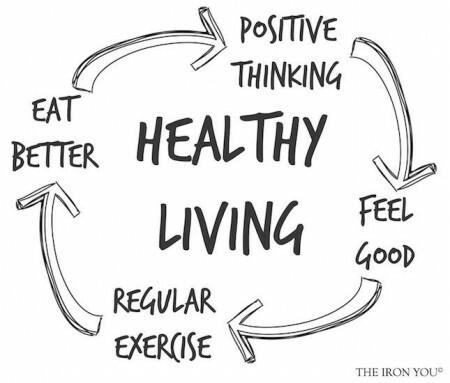 The Healthy Living Cycle: Positive Thinking leads to Feeling Good, which leads to Regular Exercise, which leads to Eating Better, which leads to Positive Thinking. I love this image because it reminds me of how to get back on track if I am having trouble. I can get back to a healthy life just by jumping into the cycle at any point. I don’t need to immediately limit my food choices or pound my body on the treadmill. All I have to do is jump into the cycle. If you notice, none of those things involve anything to do with food, but doing enough of them will get my eating back in control. Change my diet plan to include more filling foods like protein and veggies. Whatever your problem is, all you have to do is jump into that cycle at ANY point to solve the problem. 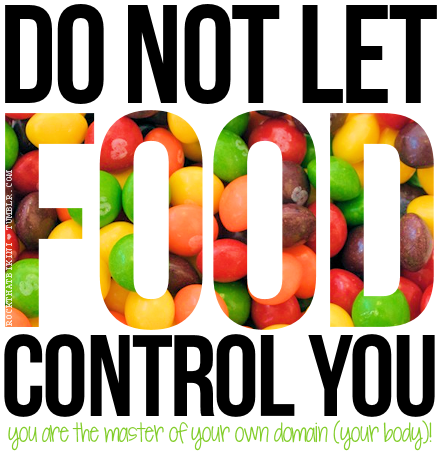 So many times, I try to fix my eating by monitoring my eating or limiting my food choices. That actually makes things WORSE for me. Instead, I’m going to focus on other portions of the Healthy Living Cycle and they will lead to better food choices naturally. The next time you feel discouraged, take a look at this cycle. Find out where you are having troubles and jump into the cycle at a DIFFERENT point to make things better. You’ll find that your problems don’t feel like that big of a problem anymore. The always funny Jenna Marbles has decided that she needs to confess her junk food transgressions. BTW, she has a minor swearing problem, so don’t be surprised about the swear words that come out of her mouth. She’s still funny. So many of the things she said were really funny, but she starts it all with this little zinger! It’s just got to the point where my underwear is getting a little tight. At one occasion, I would eat macaroni and cheese until I couldn’t feel feelings anymore. I would even eat lying down, like I can’t even SIT UP to eat. One time, I didn’t have any real food to eat, so I just ate a bag of croutons. I eat so many Doritos Locos tacos, because once you eat the Doritos ones, you can’t go back to regular tacos. The shell is just so boring. I want that one covered in cheese. And then, of course, when the Cool Ranch ones came out, I had to eat those, because I needed to see what all the rage was about. It was about hating yourself. Spring comes EVERY year, and yet EVERY year, it manages to surprise me by sneaking up on me and reminding me that I’m not ready to put on my bathing suits yet. She hopes that by sharing her confessions that she will get a new slate and start eating healthy again and stop being so “squishy.” I wish her the best of luck! After years of suffering in food service under the hand of food obsessed elitists, he gets a little nervous every time he goes into a Trader Joe’s Grocery Store. But let’s face it; many people are organic because they want to feel better about themselves. For them food isn’t sustenance, it’s a statement. It’s often a quick, easy and rather masturbatory piece of faux virtuousness. How else can you explain purchasing organic vodka? Are you kidding? You want to pickle your liver and stroke your social consciousness too? I feel the same way. After years of being told to eat more whole grains, my digestive tract was bleeding me dry. The minute I disregarded the Food Taliban, I started healing. Fortunately, Trader Joe’s has options for me. No matter whether it’s veganism, vegetarianism, organic proponents, or whole grain pushers, whenever someone thinks they have THE answer for everyone, I start to back away. Food elitism isn’t about being healthy. It’s a religion. Maybe it’s time to reconsider the idea that your diet is supposed to make you feel unique, special or superior. When they said that you are what you eat, I don’t think they meant that as a judgment of your personality, just as a guideline for food choices. 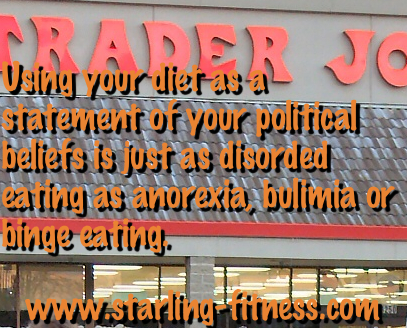 Using your diet as a statement of your political beliefs is just as disordered eating as anorexia, bulimia or binge eating. If you need to feel good about yourself, your diet isn’t going to make you feel any better than earning a lot of money, wearing the coolest clothes or exercising a lot. There is ALWAYS someone out there doing more than you and you cannot outdo the crazy people of this world. In the end, there is no ONE way that is best for everyone. We are all the same species, but we evolved over vast distances, eating many different types of food. That’s the beauty of being human: we get to figure out what works best for our individual bodies. Even more interesting, our bodies are constantly changing and what worked for us at one stage of our lives might not work very well at another. Whenever someone tries to tell you that they know the one secret to eating properly, be wary of them. Don’t spend seven years in horrible pain with a bleeding digestive system before you realize that the prevailing “wisdom” just doesn’t work for you, like I did. Be smarter than I was and reject any form of food elitism or snobbery within yourself or others. I’m very hard to catch, and if they can’t catch me, they can’t kill me. So don’t count me out. 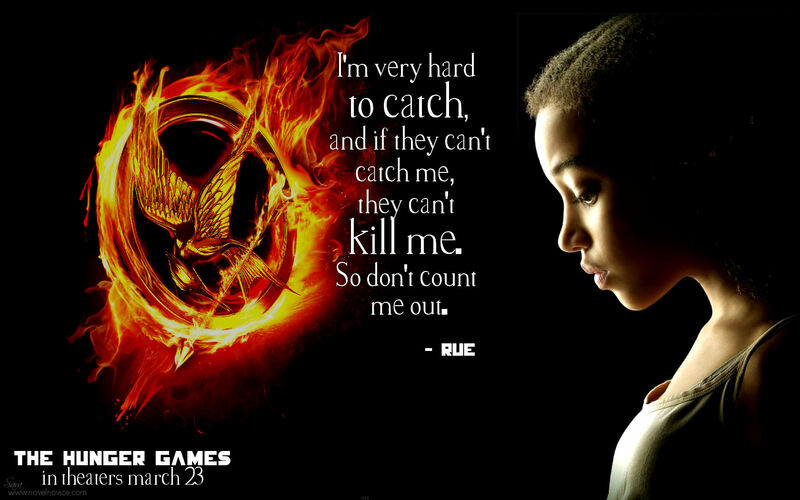 It reminds me that I need to be faster and stronger to survive in this world. I don’t live in a post-apocalyptic world that sends its children to die for entertainment, but this is a competitive world and we are judged every day by the size of our bodies. 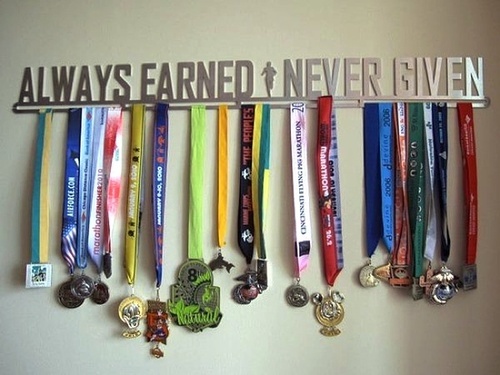 The next time you’re considering skipping your workout, take a good and hard look at this poster and change your mind. Don’t let the competition get you. You have to be strong and fast to make it in this world. As you know, I’m a big proponent of riding your bike to work and for doing your errands. It looks like my hometown is trying to make using a bike easier by instituting a bike share program. A Bike Share program is a network of many Bike Share stations, where members can take ANY bike, from ANY station, as many times as they like for a small membership fee. A 24-hour Access Pass, 7-day or Annual Membership lets you take UNLIMITED 30 min. trips at no extra charge! Every time you dock a bike, you get a fresh 30 min. If you keep one bike out longer than 30 min you get charged a usage fee. AND WE DON’T WANT THAT! Instead of renting one specific bike (bike rental), your GREENbike Membership gives you access to ALL THE BIKES at every downtown Bike Share station. If you’re not riding your GREENbike, don’t chain it up somewhere or keep it in your office. Return your GREENbike to ANY Bike Share station so someone else can take a ride. It’s actually a pretty good idea. Here is a short video showing how you would access the bike. Considering how badly many of the bike riders in Utah navigate the roads, they have created some videos showing how to make a left turn or a Copenhagen Left. I think a bike sharing program is a good idea, but I’m sad to see how few stations there are. They are all focused downtown. The Salt Lake Valley is a big place. What we REALLY need are separate, dedicated pathways to ride our bikes where we don’t have to worry about getting squished by cars. Good fitness doesn’t walk up, bite you on the bottom and say, “I’m here!” Getting fit takes good, old-fashioned hard work and research. The kind they do at Starling Fitness. Starling Fitness is one of a handful of top fitness blogs singled out for their work and research. Starling Fitness they get fit the old-fashioned way, they EARN it! The same is true for winning races or even finishing them. Here’s another image from Beyond Running that rang true for me. 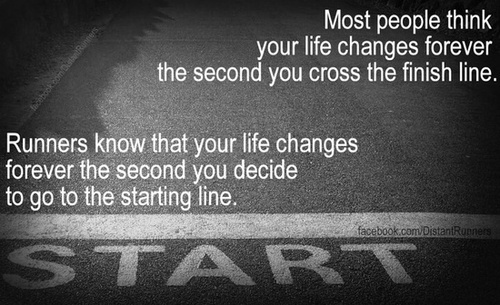 Most people think your life changes forever the second you cross the finish line. Runners know that your life changes forever the second you decide to go to the starting line. Hunger is a strange thing. It’s far more powerful than any other digestive pain I’ve experienced. I was bleeding, bloated and doubled over with an intestine trying to process whole wheat at the insistence of the USDA food pyramid, but all that pain isn’t quite as insistent as hunger. The images show up on Pinterest and Tumbler and Facebook, urging us to control ourselves and say no to food, despite the intense urging of hunger. How are we supposed do that? How do people suffering from anorexia do it? Do they not feel hunger the same way I do? Is it somehow easier for them? According to this article in Psychology Today, the answer is NO. People who have anorexia feel every urge and pang. Myth 2: Anorexics don’t feel hungry. So, even people who starve themselves feel hunger and deny it. If they can stop themselves from eating despite that physical urging of LITERAL starvation, why is it so difficult for me? Don’t misunderstand me. 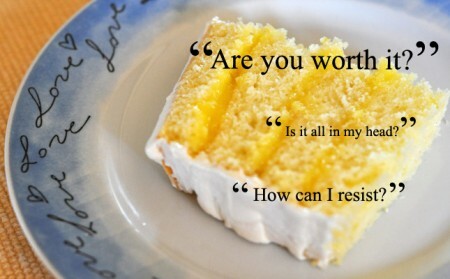 I don’t want to suffer through the pain of anorexia. I just wonder why my I cannot do what every “fitspo” and “thinspiration” Tumbler urges me to do. Part of the problem is eating the right foods. When I eat low carb, I tend to have less hunger than when I eat a higher percentage of carbohydrates. Then again, once I’ve been eating low carb for a while, I tend to have insane cravings that become downright obsessive. According to this post, I just need to take control. Think of the consequences. When you feel a craving surfacing in your thoughts, think of what would probably happen if you do give in. Will it reset your diet plan? Will it make fitting into your dress next to impossible? By focusing on the aftermath, you would be able to persuade yourself to save the munchies for later. Hydrate. If you’re not particularly hungry, opt to drink water. It will make you feel fuller, and prevent you from going through with your bingeing plans. Besides, you could probably use more fluids anyway. Eat with your five senses. If you keep rushing through your meals like there’s no tomorrow, you’ll be more likely to give in to your cravings later on. However, if you enjoyed your last meal, you’d feel a lot fuller. Keep calm and carry on. According to WebMD, cravings kick in especially when we feel stressed or anxious. We may find ourselves craving for carbohydrates because they boost our serotonin levels, which in turn, make us calm. We may also crave for a combination of fat and sugar which supposedly has the same effect on our body. Set specific limits. If you must give in (meaning you can no longer concentrate on work unless you satisfy your craving), keep your consumption to a minimum. Instead of a whole slice of chocolate cake, eat only half. Is that all it is? 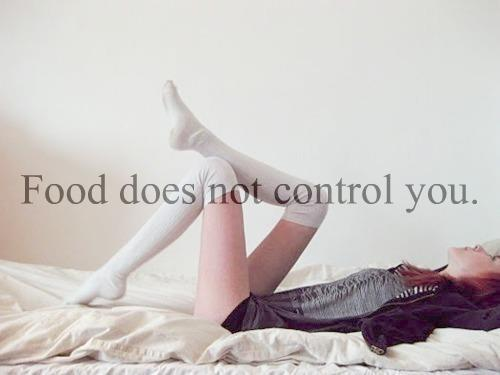 I don’t have control, whereas thin people do? Is it really that simple? Somehow, I think it’s more than that. I believe that powerful physiological factors are at work, not to mention some psychological ones. Only once we learn how to control THEM can we actually get in control of our hunger, and sadly every human body is a little different. Getting your hunger under control is going to take individual experimentation from every person struggling with this issue, including me. And, sadly, once I find out what works for me, it really will only be the answer for ME.